Designing EEG Experiments for Studying the Brain: Design Code and Example Datasets details the design of various brain experiments using electroencephalogram (EEG). Providing guidelines for designing an EEG experiment, it is primarily for researchers who want to venture into this field by designing their own experiments as well as those who are excited about neuroscience and want to explore various applications related to the brain. 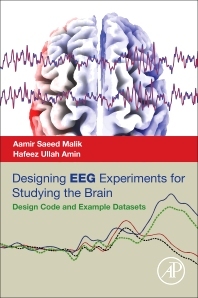 The first chapter describes how to design an EEG experiment and details the various parameters that should be considered for success, while remaining chapters provide experiment design for a number of neurological applications, both clinical and behavioral. As each chapter is accompanied with experiment design codes and example datasets, those interested can quickly design their own experiments or use the current design for their own purposes. Helpful appendices provide various forms for one’s experiment including recruitment forms, feedback forms, ethics forms, and recommendations for related hardware equipment and software for data acquisition, processing, and analysis. Dr. Malik has a B.S. in Electrical Engineering from University of Engineering and Technology, Lahore, Pakistan, M.S in Nuclear Engineering from Quaid-i-Azam University, Islamabad, Pakistan, another M.S in Information & Communication and Ph.D in Information & Mechatronics from Gwangju Institute of Science & Technology, Gwangju, Korea. He has more than 15 years of research experience and has worked for IBM, Hamdard University, Government of Pakistan, Yeungnam University and Hanyang University in Korea. He is currently working as Associate Professor at Universiti Teknologi PETRONAS in Malaysia. He is fellow of IET and senior member of IEEE. He is board member of Asia Pacific Neurofeedback Association (APNA) and member of Malaysia Society of Neuroscience (MSN). His research interests include neuro-signal & neuro-image processing and neuroscience big data analytics. He is author of 3 books and a number of international journal and conference papers with more than 1000 citations and cumulative impact factor of more than 180. He has a number of patents, copyrights and awards. Mr. Amin is currently working as a Research Scientist at Center for Intelligent Signal and Imaging Research (CISIR), Universiti Teknologi PETRONAS, Malaysia. He is involved in research on memory retention since October 2011 in the same institution and has published his work in peer-reviewed journals and indexed conferences. Prior to joining CISIR, he has received B.S (Hons) degree in Information Technology and M.S degree in Computer Science from Pakistan, in 2006 and 2009, respectively. His research interests include EEG/ERP signals analysis, long-term memory assessment and intelligent information system. Mr. Amin is a member of IEEE, IEEE Engineering in Medicine and Biology Society (EMBS), and Society for Neuroscience (SfN).